Background and objectives Patients with ESRD face significant challenges to remaining employed. It is unknown when in the course of kidney disease patients stop working. 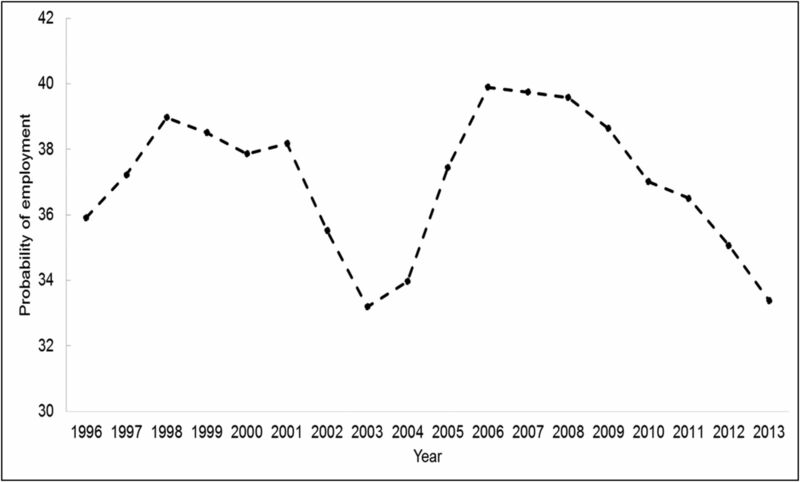 Design, setting, participants, & measurements We examined employment trends over time among patients ages 18–54 years old who initiated dialysis in the United States between 1996 and 2013 from a national ESRD registry. We compared unadjusted trends in employment at the start of dialysis and 6 months before ESRD and used linear probability models to estimate changes in employment over time after adjusting for patient characteristics and local unemployment rates in the general population. We also examined employment among selected vulnerable patient populations and changes in employment in the 6 months preceding dialysis initiation. Results Employment was low among patients starting dialysis throughout the study period at 23%–24%, and 38% of patients who were employed 6 months before ESRD stopped working by dialysis initiation. However, after adjusting for observed characteristics, the probability of employment increased over time; patients starting dialysis between 2008 and 2013 had a 4.7% (95% confidence interval, 4.3% to 5.1%) increase in the absolute probability of employment at the start of dialysis compared with patients starting dialysis between 1996 and 2001. Black and Hispanic patients were less likely to be employed than other patients starting dialysis, but this gap narrowed during the study period. Conclusions Although working-aged patients in the United States starting dialysis have experienced increases in the adjusted probability of employment over time, employment at the start of dialysis has remained low. Approximately 120,000 adults in the United States develop ESRD each year, a majority of whom undergo dialysis therapy (1). Symptoms associated with ESRD along with the need for frequent and time-consuming dialysis therapy can lead to impaired quality of life, depression, and feelings of isolation among patients receiving dialysis (2,3). In the general population, employment is associated with an improved sense of physical and psychologic wellbeing (4). Among patients with kidney disease, employment is associated with increased quality of life in multiple dimensions (5–7). The 1972 Social Security Amendments made Medicare coverage available to nearly all patients with ESRD in the United States. At the time that the law was passed, its supporters stressed to the American public and lawmakers not only that the law would provide access to life-saving therapy but that it would also enable patients with kidney failure to continue being productive members of society by remaining in the workforce (8). Although employment was a major goal of the ESRD program and despite potential quality of life and financial benefits associated with employment, the rate of employment among patients receiving dialysis in the United States is low and has decreased over time. The ESRD Network reports indicate that 28% of working-aged adults under the age of 54 years old receiving dialysis were employed in 1999, which decreased to 13% by 2013 (9). Declining employment among patients receiving dialysis has coincided with increasing enrollment in federal disability in the general (10–12) and dialysis populations; the share of working-aged patients receiving dialysis who were classified as disabled increased from 36% in 1992 to 93% in 2012 (13). Patients with kidney disease who are demographically and socioeconomically disadvantaged may be at increased risk for becoming unemployed (14). Little is known about the underlying reasons for low—and decreasing—rates of employment among patients receiving dialysis in the United States and when in the course of their kidney disease patients stop working. In this study, we examine trends in employment over time among patients initiating dialysis and in the 6 months before ESRD. We also examine whether employment trends differed among racially, ethnically, and socioeconomically vulnerable patient populations. Understanding the degree to which patients are leaving the workforce before the onset of dialysis can inform future efforts to help patients with advanced kidney disease remain employed. From the US Renal Data System (USRDS) registry, we selected all patients between the ages of 18 and 54 years old with incident ESRD between January 1, 1996 and December 31, 2013 whose first method of RRT was in-center hemodialysis or home dialysis. We selected this age range, because this is the range where employment is monitored and reported annually by the ESRD Networks. We collected information about patients from the Centers for Medicare and Medicaid Services (CMS) Medical Evidence Report (form CMS-2728), which nephrologists complete for all patients at the onset of ESRD. This included information about demographics, comorbidities, and employment status 6 months before ESRD and at the onset of dialysis (Supplemental Appendix). We used patient zip codes and counties of residence to obtain information about population density (from Rural Urban Commuting Areas codes), local poverty rates (from the US Census American Community Surveys), and county-level unemployment rates (from the Bureau of Labor Statistics). We considered patients with Medicare at the onset of ESRD to be enrolled in federal disability (15). This study was approved by an Institutional Review Board at Baylor College of Medicine. The study exposure was the calendar year when patients initiated dialysis. We examined employment in each calendar year during the study period and compared the probabilities of employment in the first 6 years with those in the final 6 years of the study period (i.e., 1996–2001 versus 2008–2013). The primary study outcome was the probability of employment at the onset of dialysis. We did not differentiate between part-time and full-time employment and considered students as employed. Secondary study outcomes were the probability of employment 6 months before ESRD and the probability of remaining employed at the onset of dialysis among patients who were employed 6 months before ESRD. Our analyses adjusted for the differences in patient demographic, socioeconomic, and health characteristics listed in Table 1. For each calendar year, we also adjusted for the rate of unemployment in the county where each patient starting dialysis lived in that year. Data suggest that patients who receive dialysis at home are more likely to be employed (16,17), likely owing to the improved scheduling flexibility offered by home therapy. Because a patient’s first dialysis modality (home dialysis versus in-center hemodialysis) can be both a cause and consequence of employment, we did not include it as a covariate in our primary analysis. We described the unadjusted proportion of patients employed at the start of dialysis and 6 months before ESRD in each calendar year. We divided the study period into three 6-year intervals and compared each covariate of interest among patients initiating dialysis in the three intervals. Because of the large population size, we used a 10% standardized difference as a marker of heterogeneity when comparing differences in covariates between groups (18). Standardized differences provide a marker of heterogeneity that is independent of population size. We used multivariable linear probability models to examine the independent associations among the calendar years of dialysis onset and the probability of employment. In all regression models, we included the calendar year of dialysis initiation as a dummy variable. To examine whether the probability of employment changed over time, we used our regression estimates to test the joint probability that regression coefficients corresponding to the first six calendar years (1996–2001) were different from the coefficients corresponding to the final six calendar years (2008–2013). We also used our regression estimates to plot the predicted probabilities of employment in each calendar year under the assumption that all patients in the cohort were equally represented in each year. In all models, we used robust SEM to account for heteroscedasticity and multiple imputation to account for missing data (19). To understand how adjustment for different patient and geographic characteristics influenced our findings, we examined the associations among the calendar years of dialysis initiation and employment in a series of nested regression models. In the most basic model, we only included the primary study exposure (indicators of the calendar year of dialysis onset) as a covariate. Next, we sequentially added the following sets of covariates in increasingly comprehensive regression models: (1) patient demographic and socioeconomic characteristics, (2) patient comorbidities, and (3) county-level unemployment rates in each calendar year. Our primary analysis and all secondary analyses used the most comprehensive (fully adjusted) model. In three separate models, we examined whether observed changes in employment were different in vulnerable patient populations (blacks, Hispanics, and patients residing in zip codes where the median income was in the lowest quintile). For each vulnerable patient population, we added to our primary regression model interaction terms denoting whether patients in a vulnerable population started dialysis in a given calendar year. We then examined whether estimated coefficients corresponding to the first 6 years of interaction terms differed from those corresponding to the last 6 years. We also conducted all analyses using modified Poisson regression models with robust SEM to approximate an estimate of the change in relative risk of employment over time. Our cohort included 480,597 patients; 145,797 patients ages 18–54 years old initiating dialysis between 1996 and 2001, 165,065 patients initiating dialysis between 2002 and 2007, and 169,735 patients initiating dialysis between 2008 and 2013 (Supplemental Figure 1). The unadjusted probability of employment declined slightly during the study period from 24% on average between 1996 and 2001 to 23% between 2008 and 2013 (P<0.001) (Figure 1A). The probability of employment 6 months before the onset of ESRD also decreased slightly from 38% on average between 1996 and 2001 to 37% between 2008 and 2013 (P<0.001) (Figure 2). On average over the entire study period, 38% of patients employed 6 months before ESRD stopped working before starting dialysis. The unadjusted probability of employment was lower in selected vulnerable populations, ranging from 17% to 22% among blacks, from 15% to 18% among Hispanics, and from 16% to 22% among patients living in zip codes with the lowest quintile of median income. 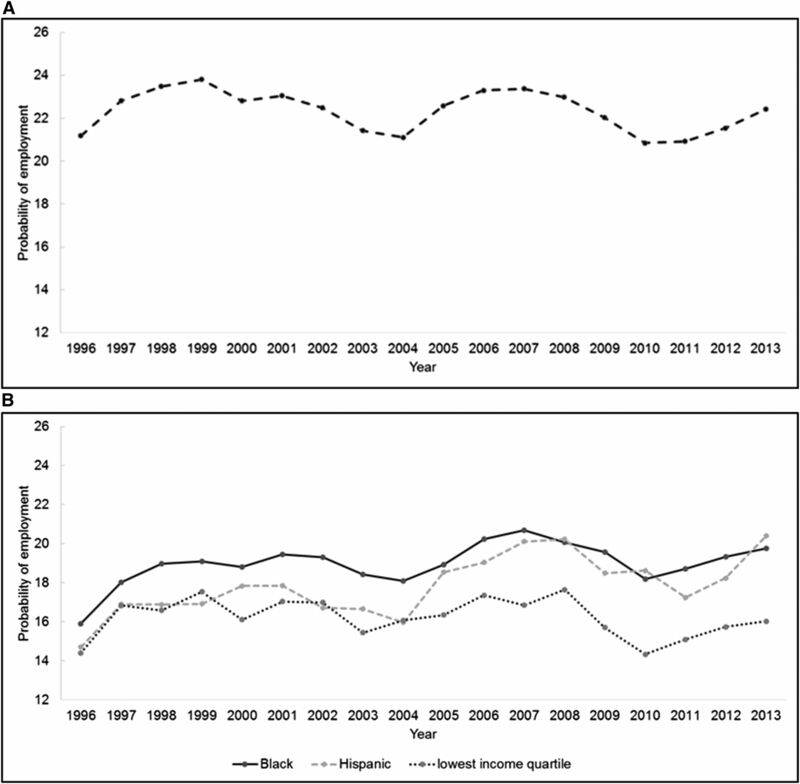 However, among blacks and Hispanics, employment increased by 1.0 and 2.1 percentage points, respectively, between 1996–2001 and 2008–2013 (P<0.001 for both groups). In contrast, employment declined by 0.8 percentage points among patients living in low-income areas (P=0.01) (Figure 1B). Compared with patients starting dialysis between 1996 and 2001, those starting dialysis between 2008 and 2013 were more likely to be Hispanic, have diabetes, and be disabled and were less likely to have cardiovascular disease. On average, patients starting dialysis between 2008 and 2013 were also older and had higher body mass index and higher eGFR at the time of dialysis initiation compared with patients starting dialysis between 1996 and 2001. The rate of unemployment in the general population in counties where patients lived was substantially higher in later years: at 9% between 2008 and 2013 compared with 5% between 1996 and 2001 (Table 1). In a model adjusting for patient demographic and socioeconomic characteristics, there was a nonstatistically significant increase of 0.3% in the probability of employment among patients starting dialysis in 2008–2013 compared with those starting dialysis in 1996–2001 (P=0.07). After including changes in patient comorbidities, this increase became statistically significant (increase of 1.6 percentage points; 95% confidence interval [95% CI], 1.3 to 1.8 percentage points; P≤0.001). In our fully adjusted regression model that also accounted for changes over time in county unemployment rates, patients initiating dialysis between 2008 and 2013 had a 4.7-percentage point increase in the absolute probability of employment at the start of dialysis compared with patients initiating therapy between 1996 and 2001 (95% CI, 4.3% to 5.1%; P<0.001) (Figure 3, Table 2). There were increases over time in the adjusted probabilities of both being employed 6 months before the onset of ESRD and remaining employed by the start of dialysis (Figure 4, Supplemental Tables 1 and 2). All three vulnerable patient populations examined were less likely to be employed compared with other patients initiating dialysis throughout the study period. However, black and Hispanic patients experienced a more rapid increase in the adjusted probability of employment over time. Compared with nonblack patients initiating dialysis, black patients had a 10% lower probability of employment at dialysis initiation between 1996 and 2001. Between 2008 and 2013, blacks were 7% less likely to be employed than nonblacks, representing a 3.4% increase over time in the absolute adjusted probability of employment relative to nonblacks (95% CI, 2.8% to 4.0%; P<0.001). Similarly, Hispanics starting dialysis between 1996 and 2001 had an 11% lower probability of employment. This gap narrowed to 8% in the 2008–2013 period, representing a 2.3% increase over time in the absolute adjusted probability of employment relative to non-Hispanics (95% CI, 1.5% to 3.1%; P<0.001). In the first 6 years of the study cohort, patients in the lowest quintile of median income had a 7% lower probability of employment. This did not significantly change over the study period (Supplemental Tables 3–5). In the fully adjusted Poisson model, the “risk” of employment was 25% higher among patients starting dialysis between 2008 and 2013 relative to those starting dialysis between 1996 and 2001 (P<0.001) (Supplemental Figure 2, Supplemental Table 6). Our findings were not substantively different in sensitivity analyses, where we included home dialysis as an additional covariate and where we included patients receiving preemptive kidney transplants (Supplemental Tables 7 and 8). Between 1996 and 2013, employment among working-aged adults starting dialysis ranged from 23% to 24% and decreased by approximately 1%. However, after accounting for changes over time in patient characteristics along with higher rates of unemployment in the general population, the probability of employment among patients initiating dialysis increased by 5 percentage points over the study period. Increases in adjusted employment were either similar or more pronounced in selected vulnerable patient populations initiating dialysis. Although adjusted employment among working-aged adults starting dialysis increased during the study period, it remained low. Our findings combined with other studies of employment at various stages of CKD and ESRD suggest that patients progressing—and transitioning—to ESRD stop working at nearly every stage of disease progression. For instance, we found that 30%–35% of patients were employed 6 months before the onset of dialysis. In contrast, 81%–85% of similarly aged adults in the general population are employed (20). This discrepancy is consistent with a United States population–based study that showed a sevenfold decreased odds of labor force participation among patients with moderately advanced kidney dysfunction (14). The 6 months before the onset of ESRD is another time when many patients stop working. According to our estimates, 34%–45% of patients who were employed 6 months before the onset of ESRD stopped working by the time that they initiated dialysis. Evidence also suggests that patients continue to leave the workforce after starting dialysis. In a cohort of patients initiating dialysis in 2000, the rate of employment declined from 42% before the onset of ESRD to 13% over the subsequent 6 months (21). Our finding that rates of employment were low even before patients started dialysis highlights a need for effective interventions that help patients continue working before the onset of ESRD. Patients with chronic health conditions, such as advanced CKD, face a number of physical, psychosocial, and employer-based challenges (22–26) that can make it difficult to stay employed (27,28). Among patients with CKD, occupational stress impairs work ability (29), whereas depression and feelings of social isolation may create additional barriers to employment (3,30). Although vocational rehabilitation efforts directed at patients with chronic illness have had mixed success (31–33), a multidisciplinary psychosocial intervention targeting workers with advanced CKD successfully helped patients remain employed as they transitioned to dialysis (34). Psychosocial interventions that address the organizations where patients with advanced CKD work, employer perspectives, and physical and social aspects of the workplace may be particularly successful (35). Patients may be more likely to remain employed during the transition to ESRD if they are well prepared for this transition. Patients receiving in-center hemodialysis must go to a dialysis unit three or four times per week for several hours. It is not uncommon to experience weakness and fatigue after dialysis. The time and physical toll that in-center hemodialysis takes on patients combined with difficulties associated with scheduling treatments around work can make employment particularly difficult. Preconceived expectations about whether it is possible to work after developing ESRD are an important determinant of whether a patient continues working (36). Patients who are educated about what hemodialysis entails and how it could affect their schedule and ability to perform certain tasks may be better able to find ways to satisfy both their work responsibilities and health care needs. Patients who receive dialysis at home and patients who receive a kidney transplant are more likely to remain employed (16,17,37), highlighting a benefit of educating patients about different dialysis modalities and kidney transplantation. However, nearly one half of all patients in the United States have not had regular nephrology care before developing ESRD (1). Increased access to pre-ESRD care may help patients remain employed. One challenge associated with efforts to increase employment among lower-income patients initiating dialysis involves potential (real or perceived) financial disincentives to working. Many patients initiating or receiving dialysis receive social assistance. Among patients ages 18–54 years old at the start of dialysis in 2013, 30%–37% had Medicaid coverage, whereas 93% were classified as disabled in 2012 (13). Increasing enrollment in federal disability has occurred in the general population as well as among patients with kidney disease due, in part, to less restrictive screening processes, rising value of disability insurance benefits, increasing workforce participation in the population, and the severity of the recent recession (11,12). Because of the potential loss of government assistance, low- and moderate-income workers can face high effective marginal tax rates (38,39), creating an additional barrier to employment for some patients. Efforts to help patients with ESRD return to work will require addressing misconceptions about financial consequences, funding for social services that reduces existing financial disincentives, and emphasizing potential nonfinancial quality of life benefits from employment. This study has several limitations. Although employment status should be relatively easy to ascertain by a dialysis social worker, this field of the CMS-2728 report has not been independently validated. An absence of information about individual patients’ financial and work-related circumstances prevented us from examining specific reasons for leaving the workforce among patients initiating dialysis. Because comorbidities from the CMS-2728 report are only available at the onset of ESRD, our analyses of employment 6 months before ESRD rely on the assumption that there were not meaningful trends over time in the development of new comorbidities in the 6 months before ESRD. Patients who die in the 6 months before ESRD do not appear in the USRDS database, whereas some patients who die soon after the onset of ESRD also may not appear in the database (40). Whether our findings generalize to patients not captured in the USRDS registry is uncertain. Helping patients with kidney failure remain employed has been a fundamental objective of the United States ESRD program since its inception (8). The conditions of coverage for dialysis facilities require that patients be evaluated for vocational rehabilitation and referred for rehabilitation therapy if needed (41), and the ESRD Networks are actively involved in ensuring that facilities provide access to vocational rehabilitation (9). Our findings suggest that employment among patients receiving dialysis is low, and it only seems to increase over time in comparison with the sharp declines in employment among the general population. Low employment among patients receiving dialysis is, in large part, due to patients leaving the workforce before they develop ESRD. This suggests that future efforts to improve employment among patients with ESRD also need to be directed “upstream” by focusing on patients with advanced CKD before they initiate dialysis. Our findings also highlight a need to better understand the specific challenges to employment that patients with advanced CKD face as they transition to ESRD and dialysis and to identify and implement effective interventions to help patients remain in the workforce. The authors thank Hannah Crowe for assistance reviewing literature on employment and disability in chronic illness. This work was conducted under a data use agreement between W.C.W. and the National Institutes for Diabetes and Digestive and Kidney Diseases (NIDDK). An NIDDK officer reviewed the manuscript and approved it for submission. The data reported here have been supplied by the US Renal Data System. The interpretation and reporting of these data are the responsibility of the authors and in no way should be seen as an official policy or interpretation of the US Government. See related editorial, “Employment among Patients on Dialysis: An Unfulfilled Promise,” on pages 203–204. This article contains supplemental material online at http://cjasn.asnjournals.org/lookup/suppl/doi:10.2215/CJN.06470617/-/DCSupplemental.